Christmas is officially over in our house! wow that was a tangent. my real topic for today was taking down the christmas decorations. i find it a bit sad, especially beacause i have no real decoration in my apartment yet so my walls will be bare so to say after everything is down. :( but this year even i feel the need to get christmas packed away. i am hoping this changes next year though. my apartment comes with a basment storage room that locks. i really like that i can store my stuff locked away and not worry about, but there is a very serious downside. last summer, shortly before i moved in the basement flooded and aside from every who had things on the floor getting there things ruined, the basement really smells like mold. i will admit that it has gotten better, but i am still warry of putting anything with fabric or the slightest smell absorbancy down there. sadly i have no space in my apartment and really no other choice. i have come up with an idea and did it with the halloween stuff. i bought two plastic tubs (those are soooo expensive over here, 10 bucks each and that was after searcing for the best price) and i crammed all our halloween stuff in them. then i taped, with clear duck tape, around the space where the lid connects with the box to try to limit the air that can get into the box. i am hoping this works, but i have no way of know thill next year when i bring the decorations out again. tomorrow i am going to go and buy the boxes to put the christmas stuff in and hope for the best. well i am off to try and sort out the rest of the chrismas stuff and get it ready to put away tomorrow. night night my bloggy friends! So looking back on today (with my glass of wine :) ) it wasn't as bad as i though it was going to be. I work for a wholesale store. today was inventory day meaning they were only going to be open till 6:00 pm. that is when i was supposed to get off (hahhaha). I was actually supposed to work at the check (which is where the items are scanned, but not paid for), but for some reason my boss thought it would be a great idea to have me clean up the shelves in the candy section and pull everything forward to make it easier for the inventory later. trust me, that is a much better job than just sitting at the check all day. it was a lot of work and after wall all the boxs and plastic wrappers rubbed a cut in my wrist and finger! i was really suprised that i was doing anything that could cause that. i do have to ment that when i finished i felt a real sense of having accomplished something. The women who is actually in charge of the candy was impressed with my work and asked if could help start the inventory counting. i was thrilled. it really made me feel like i had done something right, not only that she was impressed but i was actually able to put what i just done to use. :) i am really worn out though from standing on top of the bottom shelf on my tip toes to reach to top shelf and then practically laying on the floor (in the most professional manner possible of course) to reach the back of the bottom ones. it is a good worn out feeling though. The little prince was at his Oma's all day. i think she enjoyed it as well as he did. He came home with a huge stuffed shark that is actually (thankfully) for his papa's house. He is in bed on time tonight because school starts back tomorrow. YAY!!! oh wait no that is my reponse not his. i know he is excited to see his friends again (we did not see anyone over christmas break for some reason. i think though it had a lot do with everyone being so sick of being out in the snow). As long as he gets past that first morning of getting up again, i think he will really be fine. speaking of the little Desi one, he had a huge experience over the christmas break. He cut his hand open and had to have stitches! i was not at the scence of the crime ;) but his papa was babysitting Desi's cousins and brought desi with him. while papa was playing with the little girl in the living room the little boy wandered off, so he sent to get him. The boy went to his room which is at the oppisite end of the hall next to the apartment door. the door has small glass panels about halfway up and desi was running down the hall after his cousin and tripped on a pair of shoes next to the door and put out his hand to break his fall and end up hitting/going though one of the glass panels in the door instead of hitting the wood. He tore open his arm and cut his hand near his wrist. it was apparently very bloody and his response was "papa i need a band aid". the only witness was a two year old who said "Desi, Tür, kaputt, owe" which translates to: "Desi, door, broke, ouch". His papa was in total shock and didn't know what to do as he had 3 kids at that moment. a neighboor came down to watch the kids while the mom and dad were on their way home and Desi got to ride in an ambulance, he even got lights and the siren on. I got a call about an hour after it happened that i should come to the hospital and desi's papa had arragned for his sister to come pick me up. poor desi was in such shock still when i got there, but said it didn't hurt. we were told he would need stiches and that on children that small he would need full ansthesia so that he would be calm enough for it. the problem was that desi had eaten shortly before that and had to wait two hours at least which ended up being about 8 pm, but a few emergancies came in between and he was not operated on till midnight. in the meantime the piece of skin, that he had practially ripped off, died so they had to cut it off and tightly pull his arm back together. the surgry took 45 mins and i stayed at the hospital till about 3 am. we disscussed with desi beforehand who he wanted to stay and he said papa (which i think was better since papa was so worried and felt so responsible for the whole thing even though it was truly an accident that could not be helped.) Desi was out the next day and had no pain. he gets his stiches out next week. it was scary, but for what happened it ended up not being as serious as it could have been. its a shame that it had to be his left hand (he is left-handed), but he has no nerve damage (well there may be a slight bit that will heal in his thumb) and when he had his bandaged changed last week the doctor said it was hearling up really well. other than that our christmas break and new year were uneventful and considering all that has been going on, i am thankful for it. i am going to call it a night now. i have to get up for school too! well ok i have to get up to make desi's school breakfast and see him off. so goodnight bloggy friends! I have discovered something really awesome. i want to share with you guys. I doubt any of you are familiar with this but it is the LÜK system (it may also be spelled LUEK). This system is wonderful. The idea is that you a workbook filled with fun problems and using the answers tiles you child works through the problems and can check them himself at the end. It perfect for car rides or quiet time! A few years ago we recieved this set for Desi for his 2nd birthday. My german was not very good so i had a very hard time figuring out what to do with this thing. I eventually gave up and tossed it on a self in his room thinking one day Desi might figure it out. Well shortly after my abitur, Desi (now 4) asked me what that was and how to use it. I finally sat down figuring that if i could and abitur i could certainly figure out something ment for two year olds. I worked on it for about two hours. then i finally understood. Now our collection has grown. We have: a coganative thinking for two year old, matching for 3-5 year olds, beginners addition and subtraction for 4-6 year olds and beginners reading for 4-6 year olds. These however belong with the baby version of the set. only up to 6 years old. These are really nice introductions for kids to learn the system and build confidence. Desi really love the Math set. The only problem for me is that it is all in German. I am trying to find a way to order some from England, but they do not like shipping outside the UK...hehe. This is the math book. The problems at the top each have a corrosponding picture and the tile with that picture is layed over the answer. in the end the child closes the case and truns it over. on the back is a pattern that needs to match the one on the page. if it matches then then all the answers are right. if not then the child has to go back and figure out which one is wrong. A couple of days ago i went shopping. it was the first time in about two months that i had gone any shopping except grocery shopping. I was beyond excited. Not just about getting some new things, but about what i was going to get. I finally decided that i was going to buy Desi some new sand toys. I debated for weeks because as Desi and i are going to be in the USA for 3 months we don't need to take unneccesary things with us. I ended up deciding that as he is only 5 years old and will be alone at a beach house (school is back in and my sister or cousins don't have time to come visit) getting some cool beach toys would the best i could do. This is actually a picture of the store in barcelona (from the internet). Ours has a cool entrance like that though. 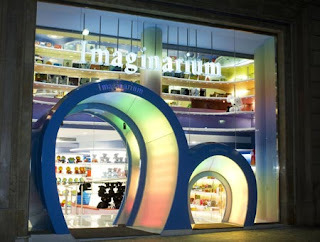 This store is awsome. they have learning based toys and really are not too expensive. My sister-in-law refuses to by any toys made of plastic or that are colorful in any way for her children (no i do not understand why either), but even she own several toys from here. I know i had to give it a try. So i went hoping to get one of the really really awsome sand sets i saw earlier this summer, but most everything was sold out. on the bright side though what was left was marked way down. A brick making set to build a sand wall (it is a german beach thing to build a sand wall, but really really fun). I am really wondering how well this will work. And last the Acropolis. Why? well because it looks really cool! it was only one they had left, earlier this summer they had four or five different famous landmarks you make out of sand. yes my dear friends i am counting down. I love my home, my life, my family and being able to be at the center of it and take care of it, but i am truly ready for a break. I am counting down my friends in 17 days, i will be on Amelia Island in Florida. I will see many oppertunities to take pictures with my new camera, a chance to put cares away and make memories with my family.